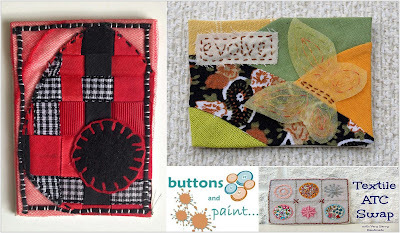 buttons and paint...: ... and a Textile ATC Swap! 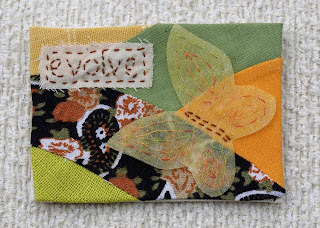 ... and a Textile ATC Swap! 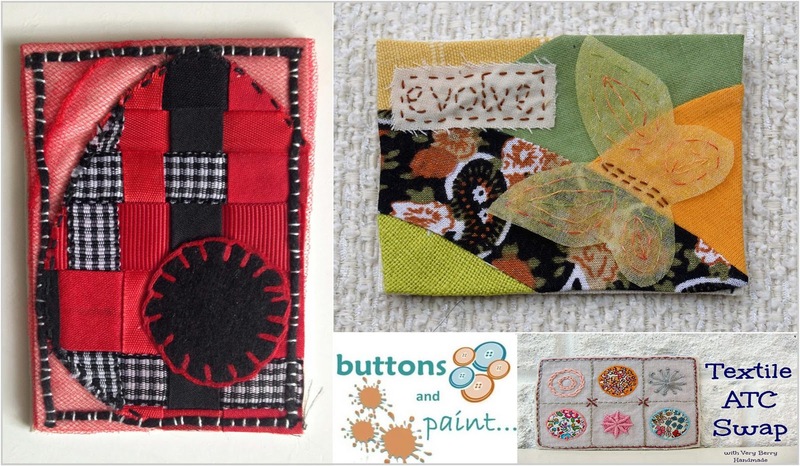 As you may have seen from our sidebar, we recently signed up for a Textile Artist Trading Card (ATC) swap, organised by Ali at Very Berry Handmade. The theme is 'Something New' - we were free to interpret this however we liked. The back of the card must show the artist's name, date, an email address and the card's title (if it has one!). This was a secret swap and open to everyone - from beginner to expert! This was the first time that either of had made an ATC, so it was a bit daunting to think that we would then be sending them to someone else! But deciding to be brave, we signed ourselves up and had great fun making them! "I like bright and clear colours. Having said that I also love the muted more natural look of zakka style and deep jewel tones! My most favourite colour is probably red, not so keen on shocking pink or neons! I like both abstract and more representative themes. Probably more of a ""modern"" preference in textiles (not just fabrics - very much the in textile art) rather than traditional. I admire the art of Gustav Klimt, Kandinsky, Rob Ryan and Poppy Treffry (those are off the top of my head!) . I love 1950's design - but also art deco. I have very eclectic tastes!" I decided I wanted to try a new technique for the 'something new' and make new fabric out of woven ribbons. 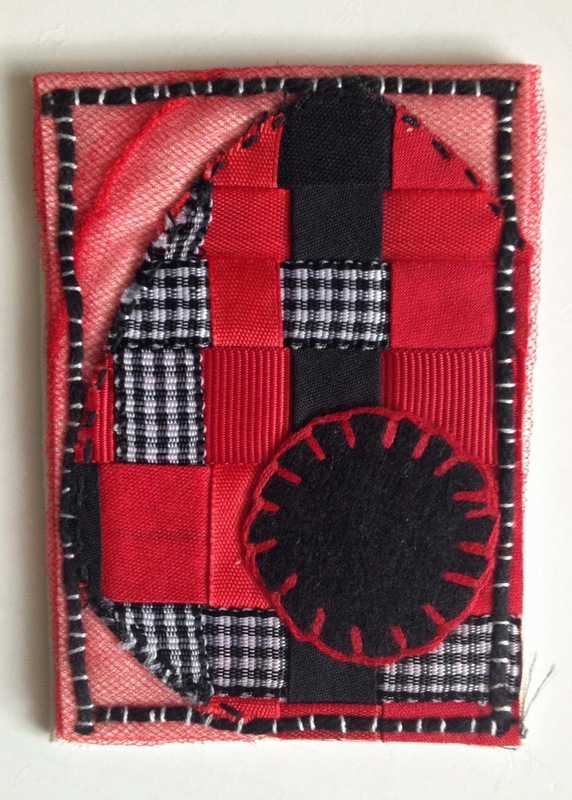 I then cut an abstract shape out of this and built up the card into layers of cotton, netting, felt and the woven ribbons. I embellished with some embroidery and finished off with a couched wool border all the way around. "I love autumn colours and all things related to nature and the natural world, butterflies are a favourite". I interpreted the theme 'something new' as the metamorphisis of a butterfly over a landscape of a sunrise, which also symbolised a new day. 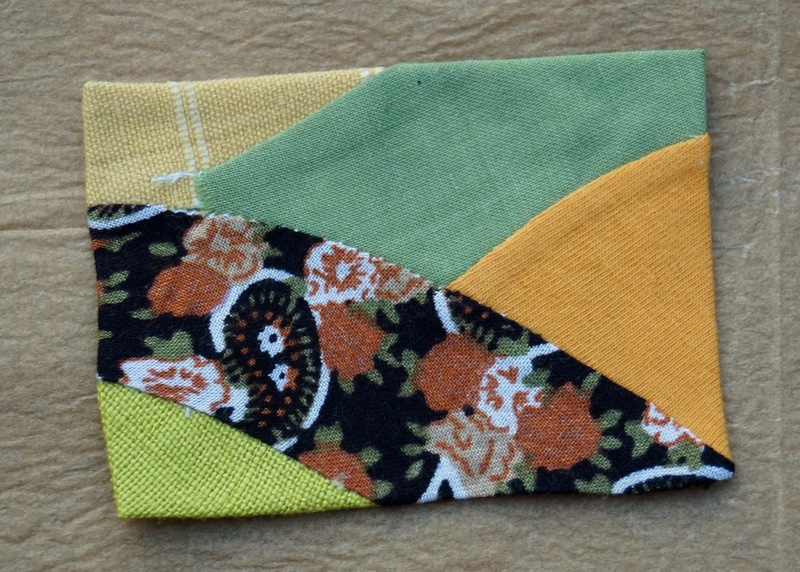 The background of my ATC was made by piecing together different fabrics and I tried curved pieces for the first time (again fitting with the theme of something new)! The butterfly was made by layering organza together with fuseable web, then finished with some stitched detail. Aren't they lovely?! It was so nice to receive something made personally for us which had so much time and thought put into it. You can take a look at the Flickr group here to see a selection of all the great ATC's made. 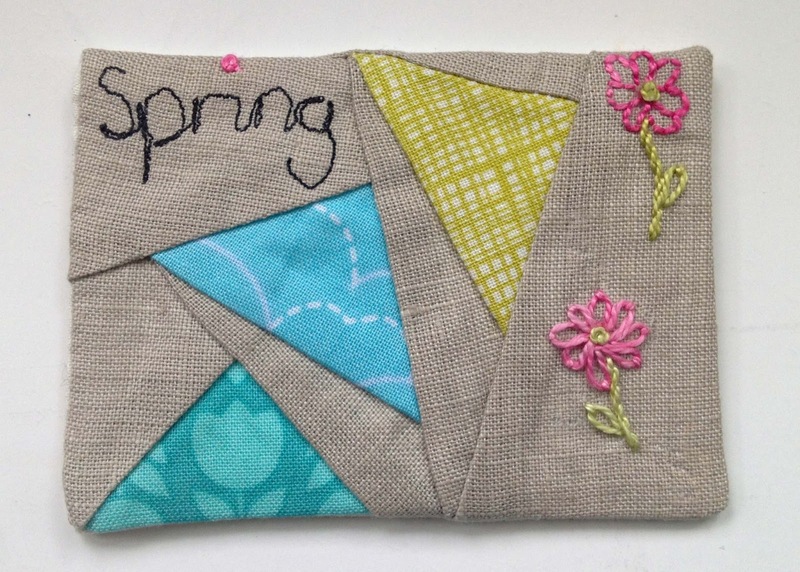 We had great fun taking part in this swap and can't wait for the next!! 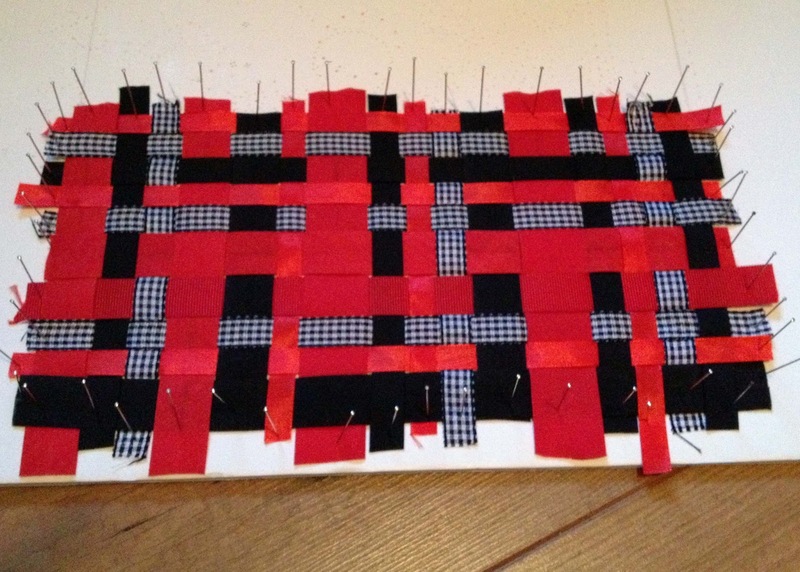 Great job all round, the woven fabric looks quite spiky to make! The woven piece is fantastic - great post! Those ATCs are all lovely! I'm looking forward to the next one too. All the ATCs are such pieces of art,love the butterfly one the best. 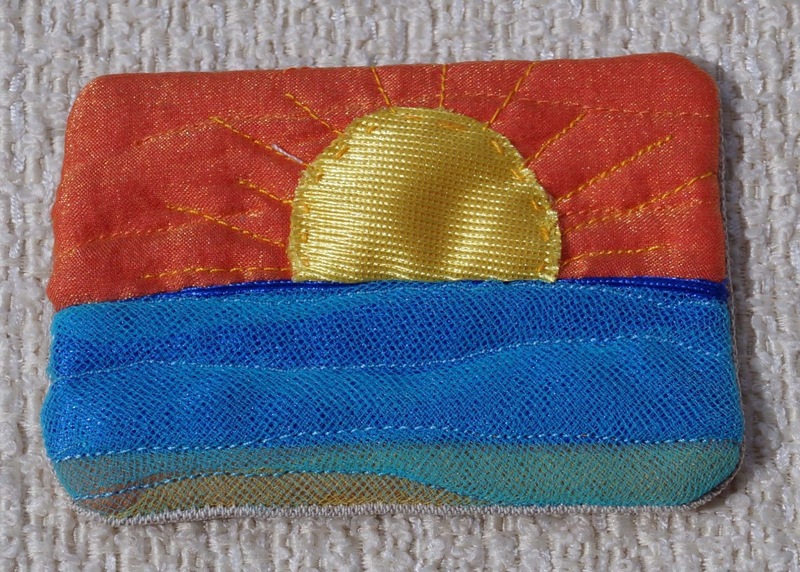 We're taking part in this ATC swap!